We are delighted to post the second in Professor Margaret Kenna’s Theodore and Mabel Bent-related series of ‘incidentals’ covering the Cycladic island of Anáfi. Margaret is a retired social anthropologist from Swansea University who has been carrying out research on Anáfi, and among Anáfiot migrants in Athens, since 1966. She has written two books and many articles in English about her research: Greek Island Life: Fieldwork on Anafi (2nd edition 2017, Sean Kingston Publishing), and The Social Organisation of Exile: Greek Political Dissidents in the 1930s (2001, Routledge). A Greek translation of the second book was published in 2004 by Alexandreia Press. Many of her articles, in English and in Greek translation, can be found on the websites: academia.edu and ResearchGate. She has also written several booklets which can be found in tourist shops on the island: Anafi: a Brief Guide; Anafi: Island of Exile; The Folklore and Traditions of Anafi, and The Traditional Embroideries of Anafi. She was made an Honorary Citizen of the island in 2006. This second ‘talk’ in Professor Kenna’s thyme-scented series involves ‘Antiquities and Inscriptions of Anafi in the Bents’ time, later, and more recently’, presenting, perhaps for the first time, a fascinating introductory synthesis of the antiquities and inscriptions touching on the Bents, through a lens of 100 years. We very much hope you enjoy it and will look out for forthcoming Anáfi ‘talks’ soon on our site; by all means send in your comments to the Bent Archive! “During their stay on Anafi in early January 1884, the Bents visited some of the antiquities of the island and noted some of the inscriptions. These were to be recorded later in detail by Hiller von Gaertringen, the famous archaeologist and epigrapher, who visited Anafi in 1898 when he was excavating on Santorini. 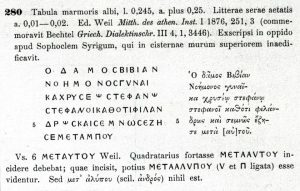 “The inscriptions can be found (with details in Latin as to their location and condition) in Inscriptiones Graecae vol XII, fascicle iii (referred to here as I.G.). A photocopy of the section on Anafi was given by me to the island Museum, where headless statues from the Hellenistic city, known locally as Kastelli, are stored. 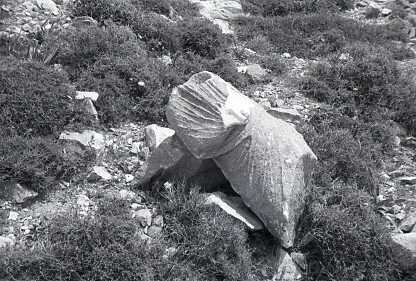 Figure 1: Headless statue on Kastelli, summer 1967 (photo: M. Kenna). “Theodore reports visiting the house of an elderly man, surnamed Chalaris (the same surname as the ‘demarch’) who had assisted in the excavations of Ludwig Ross on the island in 1836 (nearly fifty years earlier). The house of this ninety-year old consisted of one room (like most of the village’s barrel-vaulted houses) and had ‘endless archaeological trophies scattered around. With pride he pointed out the various objects he had collected – the torso of a statue let in over his door, an inscription let into his well before the house’ (Bent 1885:45). This must surely be I.G. 280, which is described as being located in ‘the back wall of a cistern in the village house of Sophocles Syrigus’. 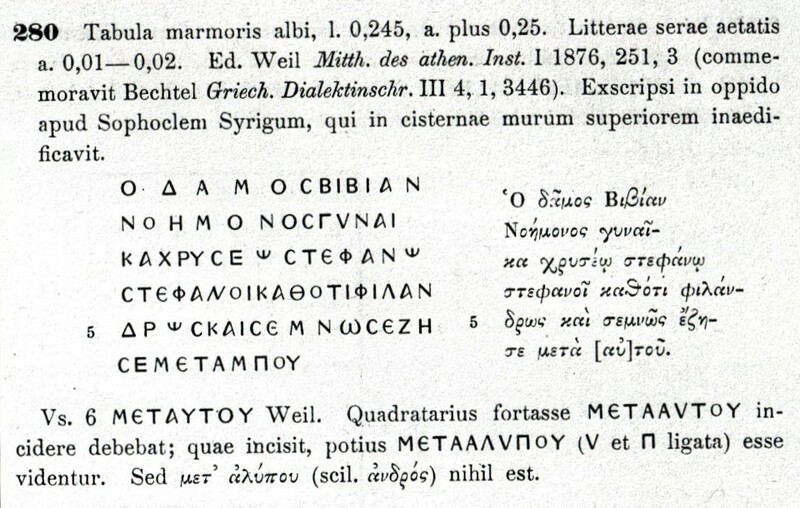 Figure 2: Excerpt from I.G.XII, iii: page 64, recording what is probably the inscription at the back of Chalaris’s well (source: I.G.XII, iii: 64). “Another inscription recorded by Hiller (I.G. 256) is described in Latin as ‘murus gallinario tectus est’ (‘now the wall of a hen-house’). Figure 3: Excerpt from I.G.XII, iii, page 60. The whereabouts of the henhouse have not been discovered! (source: I.G.XII, iii, 60). “Some of the school-teachers posted to the island when a secondary school and high-school were created in the 1980s and 1990s were interested in archaeology and the history of the island. One of them showed us some finds. 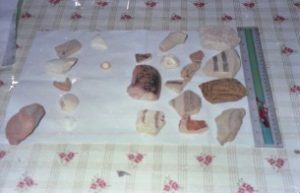 Figure 4: Summer 1988: pottery shards found in the village (photo: M. Kenna). Figure 5: Summer 1988 ‘in a shed at the house of…’ (photo: M. Kenna). 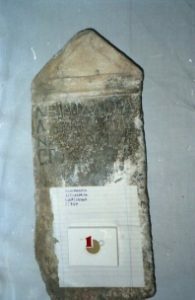 “In case it had not been recorded before, we not only photographed it, and tried to copy the inscription, but also improvised a way of indicating its measurements – a Papastratos #1 cigarette packet! Figure 6: Summer 1988: maybe an unrecorded inscription? – but no…. (photo: M. Kenna). “It was later identified by an epigrapher who has worked on the island, Angelos Matthaiou, as I.G. 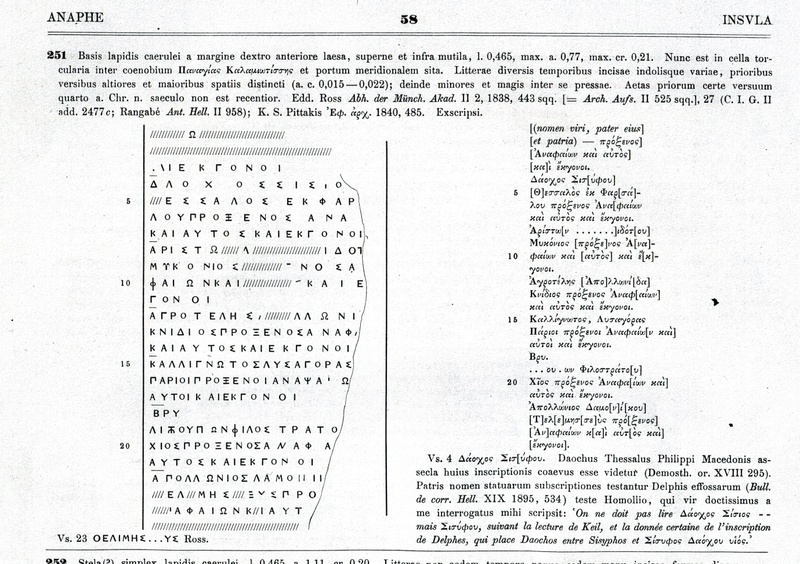 XII, iii, 318, page 68 (see the Greek Epigraphical Society website). Angelos and his colleagues have discovered, or re-discovered, many of the inscriptions recorded in I.G. One he found was at the Lower Monastery’s former grape-treading building (patitiri). His discoveries can be found in Supplementum Epigraphicum Graecum (SEG) and in the journal Horos. 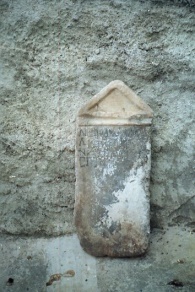 Hiller notes that this stele is ‘in today’s village, in the wall below the window of the house of Perulis Drossos’. Figure 7: I.G XII, 3, number 318. “Theodore recorded some inscriptions in the village and at the Lower Monastery (knowing that most of them had already been collected by Ross). One of these, which must have been near the Lower Monastery (because he writes ‘before returning to our boat’) was at ‘a ruined house’ and gave a list of ‘seven consuls from different parts of Greece, resident at Anaphi – one from Thessaly, others from Mykonos, Cnidos, Paros, Chios, Lacedaemon, and Siphnos’ (Bent 1885: 50). This must be I.G. 251. Hiller’s entry for it states that it is in the Monastery ‘in cella torcularia’ (in the pressing room, either an olive press or a wine press – in this case, wine-press). Figure 8: I.G XII, 3: 251, the seven ‘consuls’. 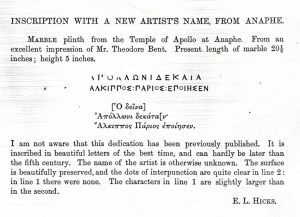 “Theodore also took some ‘squeezes’ (papier-maché impressions) of inscriptions he thought might be unknown; one of them was published in the The Journal of Hellenic Studies (1888), and also referred to by Hiller. 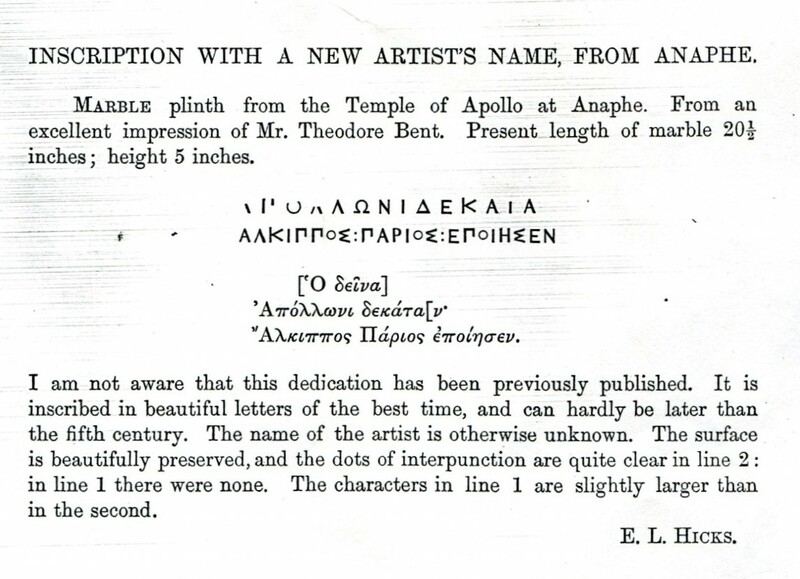 Figure 9: Reference to Bent’s ‘find’ in an article by E. L. Hicks in The Journal of Hellenic Studies 1888 (9): 90-90. Figure 10: I.G. XII, 3: 257, Bent’s work on an inscription is acknowledged (source: I.G. XII, 3: 257). Figure 11: In context. 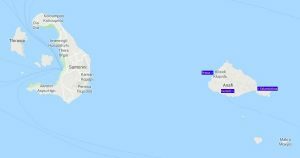 A Google Map showing the tiny island of Anafi in the Cyclades. 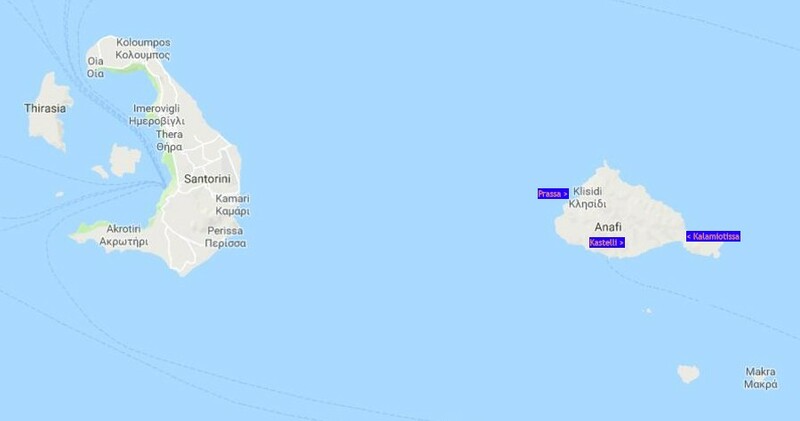 Sites shown are Prassa on the north-west, where the Bents landed in January 1884, the Classical and Medieval site of Kastelli, and the Kalamiotissa Monastery to the east of the island. * Bent, Mabel and Brisch, Gerald (ed.) 2006. The Travel Chronicles of Mrs. J. Theodore Bent, Vol I: Greece and the Levantine Littoral. Oxford, Archaeopress. * Bent, Theodore 1885 (2002). The Cyclades, or Life Among the Insular Greeks. Oxford, Archaeopress. * Ross, Ludwig 1840-1852. Reisen auf den griechischen Inseln des ägäischen Meeres (1840-45). Stuttgart, Tübingen, Cotta [https://archive.org/details/reisenundreiser00rossgoog]. 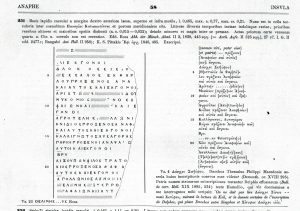 For the Greek Epigraphical Society, see https://greekepigraphicsociety.org.gr/august-2011/#more-440 (accessed 17/03/2018). With Spring (March 2018) come thoughts of Greek islands – so the Bents were delighted that Professor Margaret Kenna kindly brought this sunny link to their attention this morning.